What do you do when you want to get away from someone? Leave, of course. But what if that someone follows you wherever you go? This delightful tale presented in a black, white and red retro style is full of the energy of a hide-and-seek game. I could feel the man’s heartbeat rise with each new attempt to escape. The suspense of wondering whether he has finally broken free from his pursuer is delicious. No wonder it was on the New York Times best illustrated picture book list for 2015. However, the most surprising thing happens in the end. 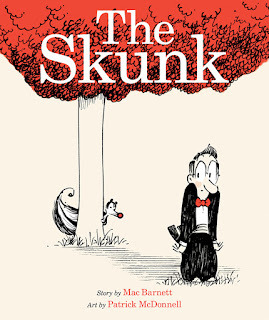 The twist made me think that The Skunk might be a commentary for something much bigger. I looked back at each illustration and found red shared by the two characters. Does the man run from what he finds in himself? Is this tale a metaphor for anxiety? Whether you are three or ninety-three, there will be something in The Skunk for you.